By Laura - Bolivia - 17 Nov/02 - Viewed 1756 times. Our last day in Argentina was spent on a bus. We left Mendoza bus station at just after 8 on the morning of the 15th. I was not looking forward to spending the whole day on the bus and for a while wished that we had flown but that feeling didn't last long. It amazes me how well behaved the children are on the buses. When I was that age I couldn't travel for more than an hour without asking "are we there yet?" or saying "I need the toilet" but they sit there quietly for hours. The bus journey was, not surprisingly, rather uneventful and we arrived in Pocitos the following day at about 8 a.m. Argentina time. As we left the bus there were several baggage handlers competing to collect our luggage but we grabbed our bags and got a taxi to the frontier for B$4.71. This is not necessary as the border crossing is only a short walk from the bus station. Going through Argentine immigration was fairly easy once they found our last entry stamp and realised we hadn't overstayed. Once you are out of their office Bolivian immigration is almost immediately on the right. We only managed to get 30 days but you can get more for free by going to one of their immigration offices. We took a taxi straight to the train station for B$10.00 and everyone seemed to know that the train left at 5 that evening. There was already a long queue for tickets and the ticket office had not opened yet. We went across to the Hotel Valentin and managed to negotiate a discounted rate of B$30.00 for only staying there half a day. It was around this point that we realised that Bolivia time is an hour behind Argentina time and we had another hour to wait for the train. Mark went back over to the train station and bought 2 tickets for the Pullman class for about B$188.50. If you are using this class then they take you straight to the front of the queue. This is a bit unfair on the locals who have been queuing for hours, especially the little old ladies at the front of the queue who were banging coins on the office window for several hours before it opened. After a hot shower and a bit of a nap we went looking for some food. Our first stop didn't quite understand my request for cheese only in my sandwich although they only put a little bit of ham in. The next place we went to was right on the plaza and although it was a bit expensive they had live premiership football on. It was the Arsenal versus Tottenham derby so I was able to see that Tottenham haven't improved at all in my absence. Buying food to take on the train proved a little difficult because all the bread sellers hang out on the same street. We eventually managed to locate it and bought a few other things for the journey. At 4:30 we went over to the train station and found a huge crowd of people queuing up to try and get their packages onto the train. The loading of goods is coordinated by the army who just about keep it under control. Our carriage was almost empty and as soon as we sat down people started trying to sell us things through the window. We only left half an hour late and there were lots of disappointed people left who had been unable to load their goods onto the train. It was very humid on the train despite having the windows open. It got dark a lot earlier than we were used to due to the time difference. They put lights on for a while but turned them off before 9:00. The seats were not very comfortable but eventually I managed to fall asleep. A little while later a very strange looking family got on and I though at first that I was dreaming. The four adults were all at least 6 feet tall, including the women. The men wore black dungarees and large straw hats and the women wore dresses made of a thick black cloth and head scarves. They had 3 or 4 children with them as well. The language they spoke sounded more like German than Spanish. I would be interested to know where they are from. They left again when the train stopped at Charagua. I woke up just before the train was due to arrive in Santa Cruz but 3 hours before it actually arrived. By this stage the train and everything on it was covered in lots of dust. I was looking forward to having a shower. The train station (which is also now the main bus station) is a 10 minute drive from the centre of Santa Cruz. We took a taxi to Residencial Sands, which cost B$15.00 but there are plenty of buses that go to the centre for B$1.50. The hostel had been recommended in the Footprint and I was tempted because it had a pool but it was a bit out of our budget at B$100.00. We ended up staying at Residencial Bolivia and paid B$78.00 for a double room. It was only 52 hours since we left Mendoza. 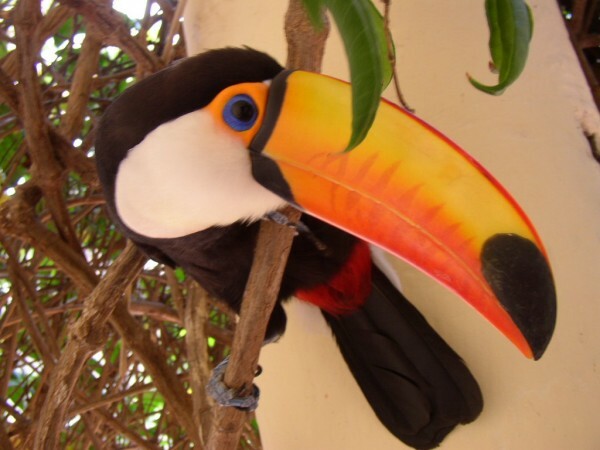 The hostel has a lovely courtyard with hammocks to relax in and two toucans that jump around. After a quick shower and a change of clothes we went to have a looked at Santa Cruz. There is not really much to see but we were only there to meet up with a friend who has been working in Cochabamba since January. We had managed to arrive a day early. We ate lunch at one of the many ice cream shops. An omelette with chips cost about B$10.00 but the ice creams are relatively expensive. For dinner we ate at Pizza Marguerita. They serve very good pizzas but a large is only enough for one person. Afterwards we went back for some much needed sleep in a proper bed.